We’d love your help. 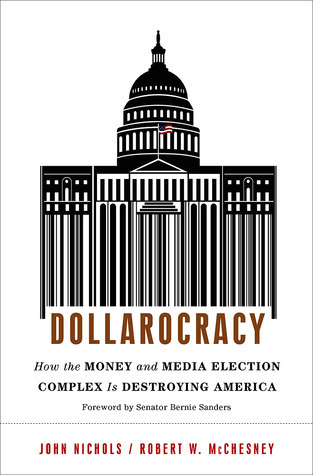 Let us know what’s wrong with this preview of Dollarocracy by John Nichols. Fresh from the first $10 billion presidential campaign, two award-winning authors show how unbridled campaign spending defines our politics and, failing a dramatic intervention, signals the end of our democracy. Blending vivid reporting from the 2012 campaign trail and deep perspective from decades covering American and international media and politics, political journalist Fresh from the first $10 billion presidential campaign, two award-winning authors show how unbridled campaign spending defines our politics and, failing a dramatic intervention, signals the end of our democracy. To ask other readers questions about Dollarocracy, please sign up. This is a book every American citizen needs to read. The public needs to be outraged before our democracy, and the free press that is supposed to hold those in power or who want to be in power accountable, will serve us rather than the wealthiest among us. This book will provide the needed outrage. Corporations, corporate media and the politicians who must beg them for money threaten our democracy. Here's how they do it, and the simple ways we can reclaim it. As with most "progressive" ideals, the expansion of the right to vote (more accurately, an informed vote free of the undue influence of corporations and billionaires) is inherently "left leaning" so a number of the individuals cited in the text were of a Democratic persuasion and most of the prime examples of abuses were seen as perpetrated by those on the "right" ~ so I'm sure that critics will argue that this book is partisan propaganda. However, there is more than a fair amount of independent As with most "progressive" ideals, the expansion of the right to vote (more accurately, an informed vote free of the undue influence of corporations and billionaires) is inherently "left leaning" so a number of the individuals cited in the text were of a Democratic persuasion and most of the prime examples of abuses were seen as perpetrated by those on the "right" ~ so I'm sure that critics will argue that this book is partisan propaganda. However, there is more than a fair amount of independent, peer-reviewed research sited to back up most of the more substantial arguments presented herein. Unfortunately, the constant negative tone (despite the professed optimism for change / the future) in discussing how far we have fallen as a nation from our ideal was incredibly depressing and the barrage of decades of concentrated efforts from the "elites" to win institutionalized rights to exert undue influence made for a pessimistic view from here forward. Wow, this book really opened my eyes to what kind of democracy we have left in the US (short version: not much) and made it clear just how critical it is that we, at the very least, amend the constitution to redefine people as only the real kind. Campaign spending limits also wouldn't hurt, not to mention limiting TV campaign advertising and creating some transparency around Internet campaign advertising. I wish I could get everyone I know to read this book. An excellent, well written examination of the heart of America's current malaise, the "complex" of Big Money and Big Media. I especially liked the forward by Senator Bernie Sanders, and the chapter of public broadcasting, it's history, the main players, and how PBS/CPB/NPR continues to be financially tied to corporations and Congress, unlike it's European counterparts. This book shatters the myth that the USA has a perfect democracy as its leaders boast when they travel overseas. In a certain way some third world countries have a better functioning democracy than the US. I would love to see an update by the author that includes the 2016 election circus. We consider our country to be the greatest democracy in the world yet we pale in comparison to other nations with more rules that reduce the time and money spent campaigning. This is an important book especially for any readers harboring the illusion that America is a democracy. This review has been hidden because it contains spoilers. To view it, click here. This book is a rehash of articles and events that happened around the 2012 election. If readers are not familiar with them then no wonder democracy is not up to standard. The authors, in the last chapter provide a list of changes needed including: protection against gerrymandering; inclusion of minority parties in the debates; the FCC to require broadcasters to provide free time to parties and candidates and more coverage of issues and campaigns; using instant runoff voting and proportional repe This book is a rehash of articles and events that happened around the 2012 election. If readers are not familiar with them then no wonder democracy is not up to standard. The authors, in the last chapter provide a list of changes needed including: protection against gerrymandering; inclusion of minority parties in the debates; the FCC to require broadcasters to provide free time to parties and candidates and more coverage of issues and campaigns; using instant runoff voting and proportional repesentation; including the right to vote in the constitution; elimination of the Electoral College; the words "people, person, citizen" not to include corporations; shorter cheaper elections; non-partisan election commissions; and independent journalism that guards against polutical propaganda.